It’s not every day that a 145-year-old candy gets a modern upgrade, but Sweethearts are doing just that. 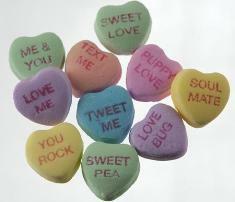 The little conversation hearts, also called Love Hearts in the UK, are getting a modern update thanks to a partnership between parent company Necco and social media and microblogging website Twitter. That’s right, you can’t avoid Twitter. No matter where you go and what you do, Twitter is there, watching and waiting like a Valentine’s Day stalker. Also added to the candy conversation were the phrases “Text Me” and “Love Bug,” which join up with old favorites like, “Be Mine” and “Kiss Me.” Apparently, “Love Bug” is a Jonas Brothers song and not a reference to Herbie. (However, I’d bet that the Jonas Brothers song is an oblique reference to The Love Bug, since they’re all properties owned by Disney).